This Volga River town Yurevets boasts interesting architecture at the Andrei Tarkovsky museum. The upper reaches of the Volga River unite some of Russia’s best known ancient towns, from Staritsa and Tver to the northwest of Moscow to Yaroslavl and Kostroma in the northeast. After Kostroma, the Volga dips and bends before heading due east, past Kineshma to Yurevets, where it turns sharply to the south in the direction of Nizhny Novgorod. This bend, or pivot, on the high right bank of the Volga where Yurevets was built formed an ideal point to survey the river for a great distance. It also accounts for the remarkable beauty of the landscape within which the town is situated—high, forested bluffs marked by ravines that descend to the main part of town along the river. Perhaps this beauty imprinted itself in some mysterious way on the imagination of the town’s most famous son, the filmmaker Andrei Tarkovsky. The founding date of the town is generally accepted as 1225, formally known as Yurevets Povolzhskii (on the Volga) to distinguish it from other towns with the same name. According to ancient accounts, it was founded by Prince Yury, son of Prince Vsevolod the Great Nest, the last major ruler of Vladimir before the Mongol invasion of 1237. Legend has it that during a river journey from Yaroslavl to Vladimir, Yury camped on the site and had a miraculous vision of an icon, or sacred image, of St. George. Responding to the heavenly sign, Yury built a log fort and a wooden church dedicated to St. George. Such legends typically served to sanctify what was a pragmatic decision—in this case to guard and fortify a strategic river bend. Just over a decade after Prince Yury’s vision, the settlement suffered from the Mongol invasion in the winter of 1237-38 - the same catastrophe that led to Yury’s death during the Battle on the Seet River (March 4, 1238). The town revived under the authority of regional princes, and in 1452 it was absorbed into the holdings of Basil II (the Blind), grand prince of Moscow. During this period, Yurevets was frequently attacked by Tatar raiders from the south, a threat eliminated in 1552 with Ivan the Terrible’s conquest of Kazan. During the dynastic interregnum known as the Time of Troubles in the early 17th century, Yurevets was beset by various warring factions. To get to Yerevets take one of regular trains or bus from Moscow following to Kostroma and then take a bus to Yerevets. For a short period in 1651 the town’s primary priest was Avvakum Petrov (1620-82), who later acquired enduring fame as the spiritual leader of schismatics called Old Believers. 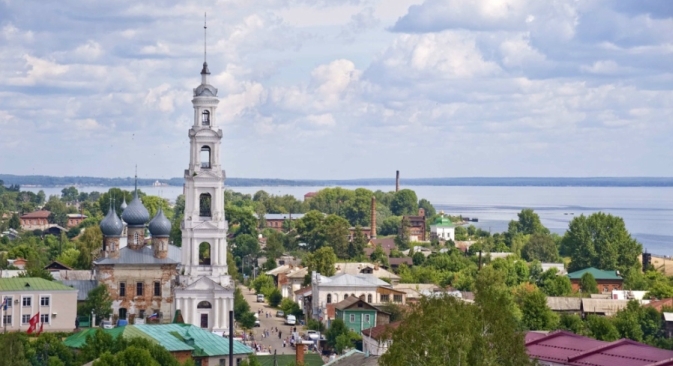 Despite its prominent geographical position, enhanced by a location opposite the mouth of the Unzha River, Yurevets was overshadowed by other towns along the Volga and the nearest rail station is the town of Kineshma, 37 miles to the west. Nonetheless, the Volga River provided the town with a transportation artery that was effectively used in the 19th and early 20th centuries by local entrepreneurs. A notable example was Alexander Mindovsky, a peasant who purchased his freedom in 1820 and became a successful textile magnate. The Mindovsky family thereafter acquired prominence in Moscow, where a number of their imposing mansions survive to this day. The prosperity of Yurevets was reflected in a number of churches, including a central complex formed by the Cathedrals of the Entry into Jerusalem (early 18th century) and the Dormition, completed in the mid-19th century. Unfortunately, these structures were much damaged during the Soviet period. Adjacent to the two cathedrals is one of the Volga River’s tallest bell towers, also built in the mid-19th century and containing a small Church of St. George—a reference to the town’s first church. The former wealth of Yurevets is also reflected in many attractive—if often neglected – houses, including some fine wooden dwellings. The central historic ensemble has several well-constructed brick commercial and administrative buildings as well as large schools, one of which was endowed by the Mindovsky family. Adjacent to the cathedral ensemble is the main trading square, still used for that purpose today. The south part of the square is anchored by a red brick pre-revolutionary city hall (now a museum). The steep slope behind the square has tree-lined streets with wooden houses, one of which is now a museum devoted to Tarkovsky (1932-1986), who was born near Yurevets and spent the war years there with his mother. Another house museum commemorates the three Vesnin brothers (Leonid, Victor and Alexander) natives of Yurevets who became perhaps the best known of Russia’s 20th-century architects and leaders of the Constructivist movement. High on the slope beyond the Tarkovsky Museum is the lovely Church of the Epiphany, built in phases from the late 17th to the 19th centuries. The design of this restored church is enhanced by its preserved ceramic decoration. After the war, Yurevets, like many other Russian river towns, was confronted with rising water levels created by gargantuan hydroelectric projects. The population of Yurevets is now approximately 11,000, roughly half what it was in the early 1970s. Nonetheless, a slight upward trend has recently occurred. Most Volga cruise ships pass by the town, but there is an increase in local tourism, aided by the Tarkovsky museum and a picturesque river location. This part of the Volga is also known for excellent fishing. Indeed, word has it that some of the catch is shipped to fine restaurants in Moscow.